This exclusive learning set is a home ballet studio for girls. Now young girls can practice their dance routines or follow along with the step by step instructional video at home. The ballet bar is simple to assemble and take down for easy storage. 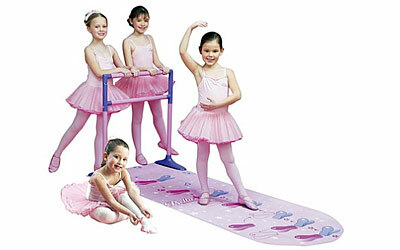 Girls can practice or learn five step-by-step basic ballet routines as outlined on the two-sided mat. This set also includes ballet slippers.